In today’s competitive world, many individuals and companies seek to stand out from their peers. One of the ways to become outstanding amongst strong competitors include commissions of high profile architects to build offices, residence etc. This new age of high profile architecture is using architecture as a branding tool.The first part of a three-part series on Architecture as Branding views the topic in terms of retail architecture. Aside from superior craftsmanship, various collaborations with prominent artists and designers such as Yayoi Kusama and Takashi Murakami to name a few, Louis Vuitton, one of the leading international fashion houses has a reputation as one of the most influential trendsetter in retail architecture. 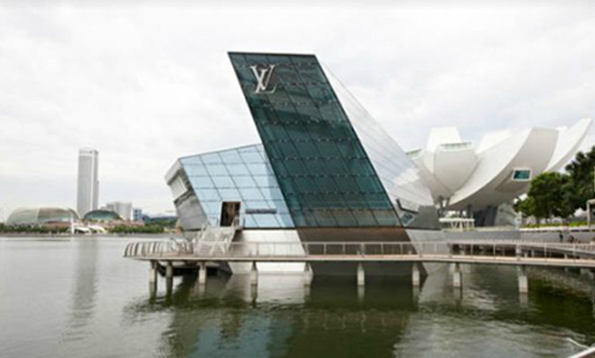 Opened in 2011 in Singapore, the first Louis Vuitton Maison in South East Asia is located at Marina Bay Sands. According to representatives from Louis Vuitton, it is inspired by travellers with a nautical spirit. Designed by prolific architects Peter Marino and Moshe Safdie, the former with an extensive portfolio in retail architecture, the architecture of this Maison sits on an island. With a striking façade, it is built using glass and steel structure. Using architecture to establish the presence of the brand in Singapore and South East Asia, the architecture of this Maison extends to the interior, to include a grand 11 metres ceiling height in the Women’s Universe area.